Here is What Have We Learned from Week 11 of the 2016 NFL Season, thanks to the AP Pro 32 for photos & help in this article. 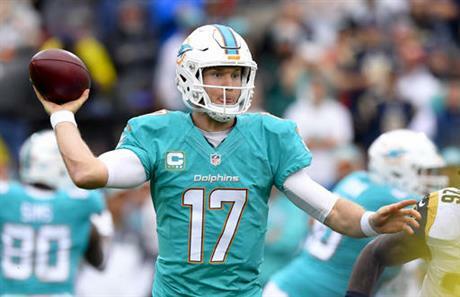 Dolphins winning streak validates Gase’s faith in Ryan Tannehill– Ryan Tannehill is winning like never before, which doesn’t surprise his coach.Even before Adam Gase was hired last January by the Miami Dolphins, he envisioned success for Tannehill. Gase, Tannehill and the Dolphins (6-4) have won five games in a row, with the latest victory the most improbable yet. Miami scored two touchdowns in the final 4:02 Sunday to rally past the Los Angeles Rams 14-10 and complete an Interstate-5 sweep. A week earlier, the Dolphins won at San Diego, 31-24. They hope to beat up on California some more when they play at home Sunday against the San Francisco 49ers (1-9). A victory would give the Dolphins their longest winning streak in 11 years. That’s heady stuff for a team that hasn’t been to the playoffs since 2008, and also for Tannehill, a fifth-year pro who has yet to finish a season above .500. He looks like a winner lately. On Sunday, Miami trailed 10-0 with 6:40 left before Tannehill directed scoring drives of 77 and 75 yards while completing 12 of 13 passes, including two for touchdowns. The performance was especially noteworthy given Tannehill’s reputation for struggling at crunch time. But then he also was knocked earlier in his career for inaccuracy on long throws, and that’s no longer an issue, as Gase playfully reminded reporters. Gase was hired because of his success with quarterbacks Peyton Manning, Jay Cutler and Tim Tebow, and now he has bonded with Tannehill. The coach’s faith in his quarterback is such that Gase took an aggressive approach with his play-calling on the Dolphins’ final drive, when they trailed 10-7. Tannehill orchestrated the comeback working behind a patchwork line. Left tackle Branden Albert (left wrist) and center Mike Pouncey (hip) were inactive, and rookie Laremy Tunsil (shoulder) departed before halftime. Sam Young finished the game at left tackle as the replacement for Tunsil, who replaced Albert. Albert said he might be able to play this week. Gase said he’s not yet sure yet who is likely to be available this week. The Dolphins were also without three inactive defenders against the Rams — linebacker Jelani Jenkins (knee), defensive end Mario Williams (ankle) and cornerback Xavien Howard (knee). Despite the injuries, Miami is in second place in the AFC East and one game behind the Chiefs and Broncos for the conference’s final wild-card spot. The schedule’s favorable, with only one remaining opponent above .500 — the Patriots, who visit Miami in the regular-season finale. When asked about the playoff picture, Gase predictably shook his head. Surging Buccaneers in middle of playoff hunt– Thanks to the steady progress of Jameis Winston, the Tampa Bay Buccaneers are back in the thick of the race for a playoff berth.The team’s 19-17 road upset of the Kansas City Chiefs lifted the Bucs (5-5) back to .500, one game behind the NFC South-leading Atlanta Falcons with six weeks remaining in the regular season. Tampa Bay hasn’t made the playoffs since 2007. Sunday’s victory was a confidence booster heading into a stretch run that’ll feature home games against Seattle, New Orleans and Carolina and road tests against San Diego, Dallas and the Saints. “We’re just jelling, coming together one game at a time,” safety Bradley McDougald said. Winston played one of the best games of his young career, topping 300 yards passing in consecutive games for the first time and not throwing an interception. The Bucs converted 68.7 percent of their third-down opportunities, with the second-year quarterback going 12 of 14 for 133 yards and one touchdown on third downs. The defense has played better in victories over Chicago and Kansas City the past two weeks after allowing 1,087 yards, including 857 passing, during losses to Oakland and Atlanta within a five-day span. “Every week is a different week,” said safety Chris Conte, who returned an interception for a touchdown against the Bears. He then earned a game ball against the Chiefs with an end zone interception that cost Kansas City — trailing 12-10 at the time — a chance to take a fourth-quarter lead. “You know we’ve got another big challenge next week. We’ve just got to keep on working,” Conte added, looking ahead to the Seahawks (7-2-1) on Sunday. Winston completed third-down throws to six receivers, including Alan Cross, an undrafted rookie tight end who had one career reception before scoring Tampa Bay’s only TD on a 3-yard catch in the fourth quarter. Receiver Cecil Shorts III is one of the players who has seen his role grow as the season progresses. The sixth-year pro didn’t sign with Tampa Bay until the week of the opener, and he had his most productive game since arriving with five receptions for 62 yards against the Chiefs. New York Giants off to best start since 9-1 in 2008– The New York Giants are riding their longest winning streak in six years, and there is no reason to think it is going to end soon.Rookie coach Ben McAdoo’s team has won five in a row and it is heading to Cleveland this weekend for a game against the winless Browns, who will be without starting quarterback Cody Kessler because of a concussion. And yet, the Giants (7-3) are not even close to peaking. The offense has been inconsistent. While the running game has posted consecutive 100-yard games in wins over the Bengals and Bears, it remains one of the NFL’s worst. Eli Manning and the passing game have shown flashes, but overall have been inconsistent. The combination of Manning to Odell Beckham Jr. is the big-play threat. The rest of the offense features a grind-it-out style that can’t afford any mistakes. The defense, ranked last a year ago, is one reason the Giants have one more win than they managed in either of the last two seasons. It has closed out games week after week during the current run, something it failed to do a year ago in losing six games either in the fourth quarter or overtime. With six games left in the regular season, the Giants have the best record among the non-division leaders. However, the wild-card race is tight and a couple of losses can quickly drop a team out a playoff spot, which is a possibility for a club that has won seven games by a total of 27 points. McAdoo has also done his best to keep the players on edge. In preparation for last week’ game, McAdoo had each player stand up, look at the person next to him and switch seats. The Giants have gotten things done. They rallied from a 16-6 deficit on Sunday behind two touchdown passes by Manning and a stout effort by the defense in the second half. “Having three home games is rare, and obviously if you can win all three of them, that’s big,” Manning said. “We did what we had to do and took care of it. Now we’ve got two road games and we have to continue to handle business. Kickers put excitement into extra points with their misses– The idea was to put some excitement into NFL extra points. On Sunday, it became unwise to head to the fridge when the kickers came in.A dozen times in Week 11, those 1-pointers became no-pointers. Blame the swirling winds. Blame the suspect blocking. Blame sloppy holding. Or point fingers at the toes of Mike Nugent and Robbie Gould, who each missed a pair of PATs. Not to mention Stephen Gostkowski and Steven Hauschka. Connor Barth and Kai Forbath. Matt Prater and Cody Parkey. And Jason Myers, who failed on seven extra points last season — yep, seven — and still kept his job with the Jaguars. “It just drives me crazy to have a poor performance that contributes to a loss,” said Nugent, whose Bengals fell 16-12 to Buffalo. Had he made both extra points, a field goal late in the game could have won it for Cincinnati. Several kickers noted they were compensating for the wind, particularly the Giants’ Gould and the Bears’ Barth, who coincidentally replaced the veteran Gould in Chicago this season. Kicking in the Meadowlands has never been a picnic, and conditions figure to get worse there and in many other NFL cities as the schedule moves along. But one of the main reasons for bringing in veteran kickers — Myers is in his second pro season, Hopkins and Parkey their third, but the rest are pretty seasoned NFLers — is their ability to handle such challenges, mentally and physically. They failed in record numbers Sunday. His coach, Ben McAdoo, was giving Gould the benefit of the doubt. “It was a tough day to kick the football,” McAdoo admitted, also knowing it was his decision to bring in Gould after the Giants waived Josh Brown in October following revelations about his abusive behavior toward his former wife. That was not the case in Detroit. Ford Field is indoors, yet Prater and Myers had misses. So what’s going on when a two-time All-Pro such as Gostkowski misses three PATs in the last five games? Or Hauschka has an extra-point kick blocked in successive games? Not to mention perhaps the play of the year last weekend, when Denver ran back a blocked extra point against New Orleans for a defensive 2-point conversion that won the game? A 33-yard kick should be automatic for virtually every NFL kicker, yet we know, 12 times over on Sunday, that is not true. Among the factors contributing are pressure, over-analysis, poor mechanics, weak blocking and, well, bad luck. Before last year, when the new rule placed the ball at the 15 for extra-point kicks, little thought or preparation was needed for such chip shots. Now, kickers — and holders, snappers and blockers — do need to think about the kicks. But they don’t get a whole bunch of extra practices on them. Kickers traditionally are a quirky bunch. That isn’t necessarily a bad thing; just look at how successful Sebastian Janikowski has been for the Raiders. But they also are prone to thinking too hard about kicks. Why else would opposing coaches try to ice them? Bad weather, particularly slippery surfaces and wind, have a huge effect. A wet ball is much harder to boot accurately, as well as more difficult to snap and hold. Uncertain footing plagues kickers’ legs and psyches. As for the wind, that’s the enemy of everyone but defenders on a football team. So those excuses sometimes work, though, again, not in the friendly kicking confines of a dome. The biggest issue for kickers comes when they get in a rut. Unlike other positions that require deep knowledge of a playbook, kickers and punters are much more on their own. When placekickers can’t find the middle of the uprights, they usually find themselves on their own and off the roster. Bengals lose Giovani Bernard; A.J. Green could be back in weeks– Bengals running back Giovani Bernard has a torn anterior cruciate ligament, but star receiver A.J. Green might be able to return from a hamstring injury this season, coach Marvin Lewis said on Monday.Scans on Bernard’s left knee confirmed the ACL tear, suffered on the final drive on Sunday. He’ll have surgery soon, costing Cincinnati its most versatile running back. Green also will be out when the Bengals play at Baltimore (5-5) on Sunday with what amounts to their last chance to get back into the AFC North race. Green hurt his right hamstring on the Bengals’ first pass of the game. Lewis said scans on Green’s hamstring detected a strain — not as severe as initially feared — and there’s a possibility he could return at some point. The Bengals (3-6-1) are a long shot for the playoffs after a 16-12 loss to Buffalo at Paul Brown Stadium. “It’s just a matter of how quickly he recovers through it,” Lewis said. Green was in the trainer’s room during the open locker room period on Monday. At one point, he poked his head out the door and, with a big smile, yelled to a teammate and then went back inside. Bernard caught three straight passes on the final drive that ended with an incompletion in the end zone. He stayed in the game for a couple of plays after getting his knee twisted and then took himself out. He went for a medical scan that detected the torn ligament. The two injuries are a significant blow to a team that has been one of the healthiest in the league. Green is among the NFL’s leaders with 66 catches for 964 yards. Bernard is second on the team with 39 catches for 336 yards. Bernard also has rushed for 337 yards, second to Jeremy Hill’s 623 yards. The Bengals self-destructed against the Bills. Mike Nugent missed both of his extra-point attempts, hitting the right upright. The Bengals considered looking at another kicker, but decided to stick with Nugent and help him work out his problems. In the past three games, Nugent has missed three extra points and a field goal. Lewis noted there was a downside to bringing in an unfamiliar kicker at this point in the season. Nugent is in his seventh season with the Bengals. The 49ers lost 30-17 to the Patriots on Sunday, giving them a ninth straight loss to tie the longest losing skid in franchise history. They also lost nine straight in 1978. Asked Monday if he’s received assurances from management that he’ll return in 2017, Kelly said he hadn’t. “We haven’t had any conversations about that at all, about anybody’s job security,” Kelly said. The 49ers hired Kelly to replace Jim Tomsula, who finished 5-11 in 2015 in his only season as head coach. Kelly’s team is 1-9 so far. San Francisco next travels to play the Dolphins (6-4), who have won five straight. Kelly will bring the league’s last-ranked defense and 29th-ranked offense to Miami. The 49ers entered the fourth quarter against the heavily favored Patriots (8-2) down just 13-10 before Tom Brady threw a pair of touchdown passes and led a drive that culminated in a field goal. Brady finished with 280 yards passing and four touchdowns. Brady sealed the win with a 56-yard touchdown pass to Malcolm Mitchell with 10:06 remaining, getting the throw off a split second before getting hit from behind by Ahmad Brooks. Titans cost themselves yet again with slow start on road– The Tennessee Titans already have proven they’re better than they were each of the past two years. To take another step forward, the Tennessee Titans need to quit falling behind by double digits on the road.They need to make the needed adjustments quickly with three of their final five games away from home. The Titans fell to 1-3 in road games this season when trailing by double digits, this time after spotting AFC South rival Indianapolis a 21-0 lead before falling 24-17 . Left tackle Taylor Lewan called the slow starts extremely frustrating and not sure what the Titans were doing in the first half against the Colts. The Titans missed yet another chance at a winning record with their latest slow start, and that’s been a constant theme this season. Their lone win came in Week 2 after trailing Detroit 12-0 and 15-3. They trailed in Houston 14-0 before losing 27-20 in Week 4. Since then, they’ve had three chances to move above .500 only to lose each time with two of those on the road. They fell behind 16-0 before losing 43-35 at San Diego and cost themselves a chance to stay in second in the AFC South after allowing the Colts to jump out to a 21-0 lead within the first 20 minutes. Titans coach Mike Mularkey said production on third down, both offensively and defensively, has been a common problem in the slow starts. Against the Colts, Tennessee failed to convert on its first three third downs, while the Colts went 3-of-5 in the first half. Mularkey said the frustrating part is the Titans struggle to convert on short yardage. Tennessee also had some other issues. Veteran tight end Delanie Walker drew an unsportsmanlike conduct penalty that backed them out of field goal range in the second quarter, and Mularkey said he told Walker that was a poor decision. Valentino Blake caught a punt at the Tennessee 2 early in the third quarter. “There’s no punt that should be fielded inside the 10 yard line by anybody,” Mularkey said. And Mularkey said coaches are discussing a possible lineup change after cornerback Perrish Cox struggled against the Colts, including having the third TD go through his hands to Indy receiver T.Y. Hilton on fourth down. Now the Titans (5-6) find themselves needing to win Sunday when they visit Chicago (2-8) just to climb back to .500 before their bye. Mularkey said he addressed what the Titans face with five games left this season with the team Monday morning and compared NFL games to whitewater rafting with each providing a different ride. The Titans coach believes it’s not unrealistic to expect Tennessee to win out. “It’s really about what we do it’s all about what we do and nobody else,” Mularkey said.